1. Start in one room. 2. Don’t do everything at the same time. 3. Start with what you have. I’m so thankful my friend, Nester, was able to join us this week! But this isn’t goodbye – you can visit her blog anytime by clicking here. 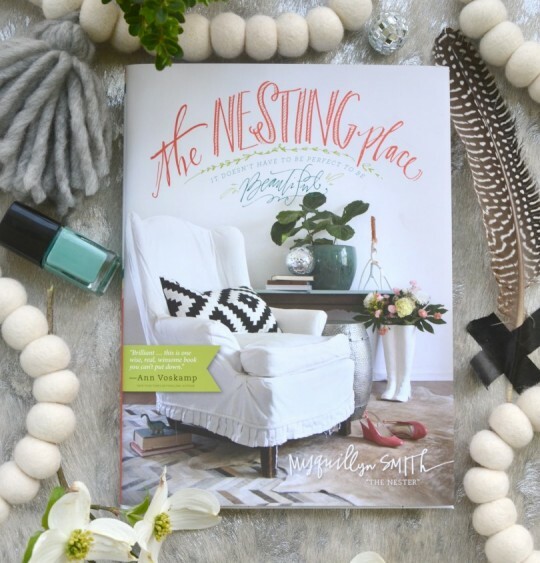 You can also bring her style and expertise into your home with her book, The Nesting Place. Click here to purchase your copy! Buying this resource today from Proverbs 31 Ministries is a great way to support our ongoing mission of getting Biblical truth into every home. Makes a perfect treat for yourself or gift for a friend. Thank you for your support! Today, I’m giving away 3 signed copies of The Nesting Place. To enter, leave a comment telling me your favorite thing you learned this week. I like the idea of shopping from your home first. And also to take everything out and start with the big things first. Wonderful Idea, we all know that God hate waste, its vital that believers don’t spend so much on material things because there many people hurting. Bible said he that gives to the poor lends to God, Proverbs 19:17 , and the whole world (including the poor, the widows) are waiting for the manifestation of the sons of God ,Romans 8:19 , meaning that if we don’t do something to address the need of the poor , no body else will do it. In the past few months I’ve been so beyond blessed by your posts on Facebook. I’ve been wondering if you have any books, or anything really, for single Christian women? Love the tree stump idea! I learned to shop my home and use what I have. I’m visiting from The Nester! What I learned in this series is to remove everything from your space except for the big pieces and then start with what you have. Thank you for these videos. I am almost done reading Made to Crave. I just wanted to say thank you for passing on to us what God revealed to you. As a life long dependent on food, it feels amazing to be turning my back on that prison and embracing the freedom that God’s power provides. I love the idea of going to thrift shops with an open mind ,,,, use what you find. To use what I have….I have things in rooms that are never used. I definitely need to do better at re-purposing! I’ve been struggling with this lately. How much time and money does God want me to put into making my home lovely? I really want to have beauty in my home and I think that’s the way God created me, but I need so much help as to where to start and what to do that doesn’t cost much and take too much of my time. Thanks for the encouragement! I am putting together our first house and trying to make it a home. I love the bit about it not needing to be perfect to be beautiful. Such a releif of an idea! To use what I have. What I could hear, I enjoyed very much. Have computer up all the way and cannot hear much.